Ever wondered what the best hamster bedding is? If you own a hamster (or thinking about getting one) the obvious answer is yes. However, figuring out what the best hamster bedding is can be a tough choice. That's why, we've done all the hard work and in the following, will tell you exactly what to get. We list both the very best bedding period (number 1) and the best budget option (number 3), so stay tuned. PS: If you're in a hurry we have listed the three best picks right here. 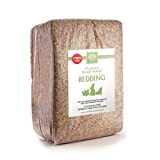 After researching more than 20 different kinds of hamster bedding and seeing our hamster test the best, we think the Small Pet Select Jumbo Natural Paper Bedding is the best hamster bedding. Please note this is the best option for both Syrian Hamsters and Dwarf Hamsters. One of the obvious things to consider in choosing hamster bedding is the material used. Paper is one of the most common and readily available in the market. Many small pet owners also prefer paper beddings since it is more absorbent than other beddings, and usually dust-free. The Premium Small-Animal Bedding from Pet Select is the top choice when it comes to hamster beddings. It is not only absorbent and dust-free, it is also safe for your pets’ delicate little hands and feet. Yes, this is one of the more expensive bedding options but you definitely get your money’s worth. Once the bag is opened, you’ll be surprised to see that it contains a whole of a lot more than it looks packed because, this bedding expands 3x in volume from its packaged size. If you can spend a little more for your pet, choose this one. 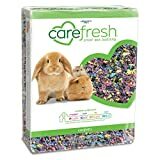 Carefresh is one of the top brands there is for a hamster bedding. There are a lot of positive feedbacks and comments that talk about how good it is in terms of absorption and in controlling odor. It is also 99% dust-free so you can be sure that your pets won’t have any breathing problems with this one. From its name, you can already anticipate that this bedding is colourful. One benefit is, it can make your hamster cage and your home become more pleasant to look at. Don’t worry, there are no studies that show colored papers can harm your pet. But of course, you should still be cautious and monitor their health especially when they ingest a foreign object, anything and any brand for that matter. Many hamster owners are using this not just because of it’s great absorption and odor control, but also because of its softness. The hands and feet of a hamster is tiny. It is necessary to ensure that their bedding is soft for their delicate hands and feet especially that hamsters are naturally a “burrowing” animal. And this bedding ensures just that! The texture of the Kaytee Extreme Odor Control bedding can be compared to tissue strips which makes this bedding good in terms of absorption. In fact, it absorbs 2x better than wood shavings. The company promises a 14-day odor control. We think that the 14-day odor control feature of this bedding still depends on many factors like the number of pets that will be using this bedding and the amount of pee it absorbs daily. In addition, this bedding is 99.9% dust-free so, you won’t have any problems with the respiratory health of your pet. Overall, the performance of this bedding is acceptable and we will recommend it for hamster owners who are looking for cheaper hamster beddings. Out of all the beddings we reviewed here, the Critter Care Pet Bedding is the only one made from reclaimed wood. It’s biodegradable and compostable after use. We like the idea that it is compostable and will not harm the environment. Out in the wild, little critters usually have wood shavings in their natural habitat which makes this bedding great because it gives your hamsters a feel of their natural environment. However, the issue with beddings made from wood is that they can be a little dusty. It exposes your pet with dusts that may give them allergic reactions or respiratory problems. Also, wood beddings are known to perform less in term of absorption. Paper beddings are still a better choice. 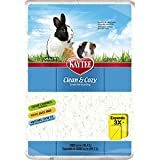 Kaytee Clean and Cozy Small Pet Bedding, White, 1000 cu.in. If you read the notes behind the packaging of this bedding carefully, you’ll realize that this is made from discarded remnants and trimmings of other hygienic products. That alone is a good reason to choose other beddings. Just imagine what kind of “other hygienic products” they used for this. Also, this product must have undergone a lot of procedures and chemicals to wash out all the dirt and filth it has. The intention of the company to use such materials was to reduce the amount of wastes that goes in the landfills. So while a great thought, make sure you are comfortable with that for your hamsters. Amazingly, few hamster owners say that this bedding performs well when it comes to absorption. After all, a lot of hygienic products are in it. Now, we have just given you the short answer regarding what hamster bedding to pick. However, if you want to venture on your own and find one, or just want to figure out how we know “what is best”, we have outlined our methodology below. Hope you enjoy it – below is an overview of the topics and you can just click these links to be taken to our research. What should the depth of my hamster bedding be? How do I know the hamster bedding is safe? In their natural environment, hamsters burrow deep underground where they build their nest. And when we keep animals in captivity, we want to mimic their natural environment as much as possible. This means it is very important to find some good bedding for your hamster. Not only will it be more enjoyable to run around it, it will also allow it to dig around in it and even make a bed for itself. Unfortunately, a lot of bedding material is sold that is simply not suitable for hamsters. For example, some stores will sell cedar and pine wood shavings which should never be used for hamster bedding as they can splinter into sharp pieces. These can hurt your hamster, causing both injuries and infections. In addition, they are often treated with a material that is toxic to your hamster. Further, there is a lot of artificial, fluffy material on the market that seems like good options. However, the hamster can get their little legs entangled in the fluffy bedding and injure itself. Finally, cat litter is sometimes sold as hamster bedding as well. Again, this should be avoided as hamster will not be able to digest the pieces they eat. In the wild, hamsters dig down as deep as ~3 feet (1 meter), so we obviously need to have some depth to the bedding in our cage. The good news is that it doesn’t have to be as deep as in nature. Instead you should aim for at least 2 inches of bedding (6 cm) in your cage, which is sufficient – however, if you really want to treat your hammy, consider adding an extra inch to the depth of its bedding. How do I know the bedding is safe? There is so much bedding out there sold as hamster bedding, which is simply not good for hamsters. So, if you go out there and got some hamster bedding, make sure to do your due diligence before buying. Your little hammy will appreciate it, whether it's a winter white, robo hamster or even a chinese hamster. … which all brings us back to where we started. 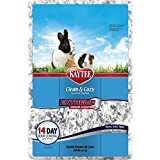 Our top-rated pick for hamster bedding is the Carefresh Confetti Pet Bedding (click to see the price on Amazon) and our less colorful pick is the Kaytee Clean and Cozy Small Pet Bedding, White (click to see the price on Amazon). We hope you’ve enjoyed this and if you have any questions, just ask them below.